There is (at least to me) great satisfaction in the restoration of old furniture, especially of pieces made prior to the nineteenth century. To take in hand a derelict piece covered with the grime of years and to clean and restore it almost to its original condition is as gracious as an act of charity. It also affords actual experience of the methods of old-time workmen and an insight into their marvellous craftsmanship. But before undertaking such a job the carpenter ought to make a study of the subject, as an incorrect addition to a piece of period furniture is a perpetual offence, a reminder that he will be wise to avoid. Dull of soul indeed is the woodworker who, having such a repair in hand, experiences no feeling of sympathy with the dead and forgotten maker. 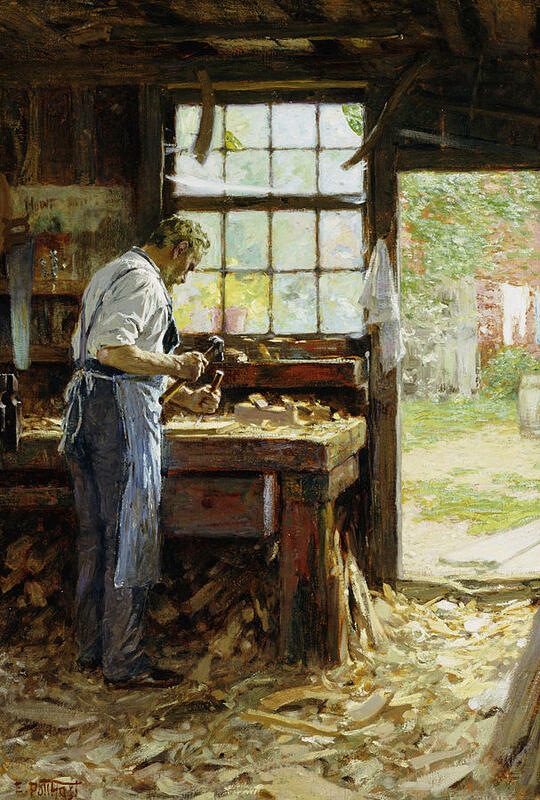 The limitations of his tools are revealed by long slight undulations on the surface of the boards, the finish of his imperfect plane. This finish is the admiration of the connoisseur, who frequently wants it reproduced on modern work. This perplexes the carpenter; his modern planes are much too true to execute it properly. For those interested in this sort of thing, I know of nothing better than Thomas Johnson's YouTube channel. I could watch him for hours.